I AM SO HAPPY WITH MY SEASONAL TABLE THIS YEAR!! And I mean really, really happy. 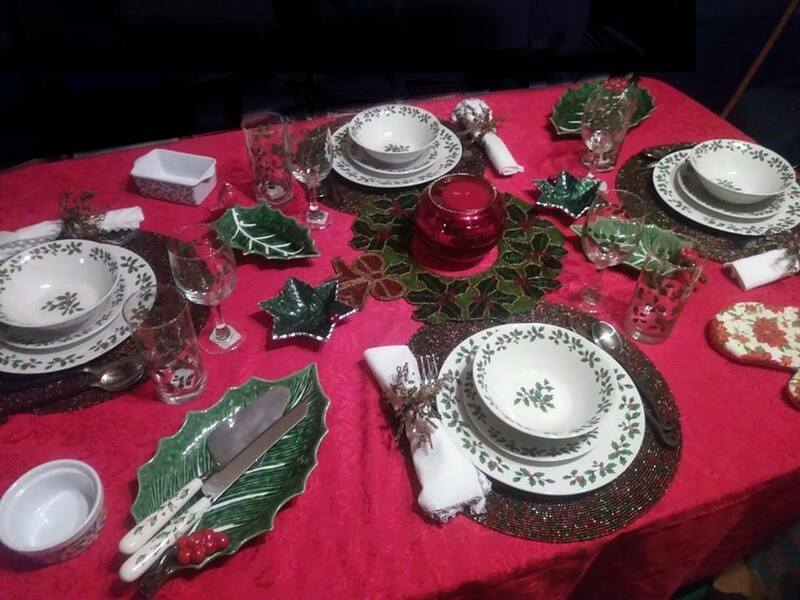 I used to set up the dining room with a rotating assemblage of dishes depending on the time of year, but R wasn’t into the whole set-up-seasonal-decorations-thing or taking them down and it’s a TON of work and I just got to the point where I wouldn’t/couldn’t do it myself. But being the Three Bears has helped us all, and one way is that R actually put up a tree this year! We all worked on it and it is so lovely it makes me smile and feel warm inside every time I see it. Which is quite a bit! Yesterday we bought candy cane striped stockings with B, N and R on them and hung them on the mantle! And as you see here, we assembled between us a new set of dishes we found in town and together older ones from a bygone decorating era, set up a gorgeous table. I almost have a ten piece setting, short three dessert plates and that should be taken care of today! Got a matching tea kettle yesterday and ordered a salt and pepper shaker today. I found a perfect cutlery/flatware set, but it really is going to be too expensive this year (especially considering I would need two sets to make an 8-piece setting) and I am hoping it will be available later. It’s not that I think I will be serving eight anytime soon, but that also makes sure I’m covered in case of breakage. The Thanksgiving table was pretty special too, and I bought some additional stuff at the after Thanksgiving Day sales. Here is something else wonderful! Noah is into all the decorations! He really is! He says it reminds him of his childhood and he is more than wiling to help. He doesn’t have the gay decorating gene so I will have to do most of that, but he does have the organizing gene and loves to set himself to doing projects so he will make sure stuff gets packed up and that is what I really need. Special thanks to my dear wondrous and magickal friend Linnea for the stunning place mats, napkin & rings, and center piece. She brought them to me in the hospital and raised my spirits considerably! I hope you are keeping your holiday spirits high! Keep it merry! This entry was posted in Essays, real life. Bookmark the permalink.